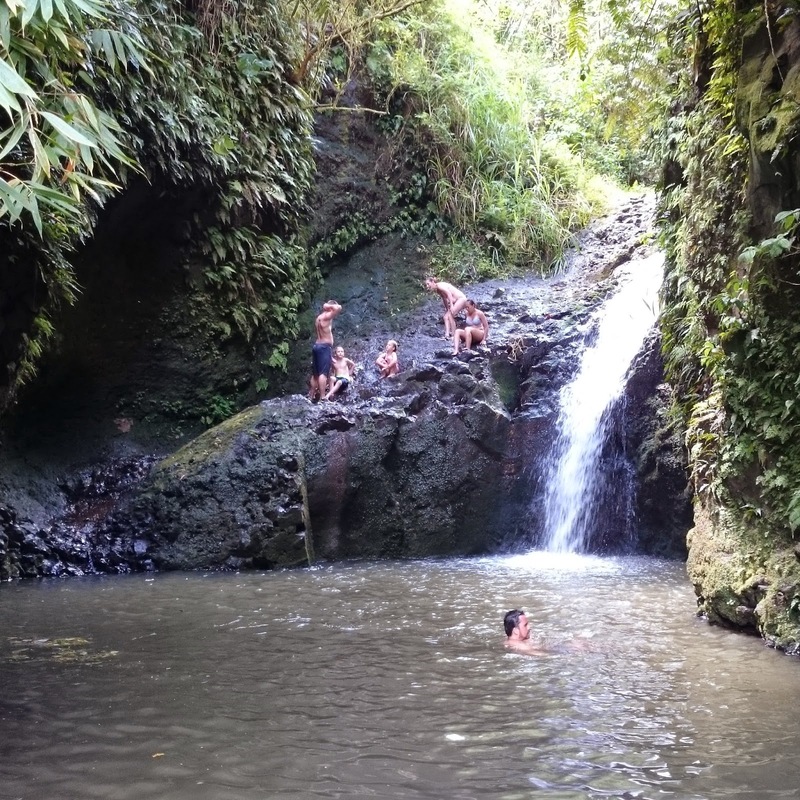 Maunawili Falls and the watering hole. 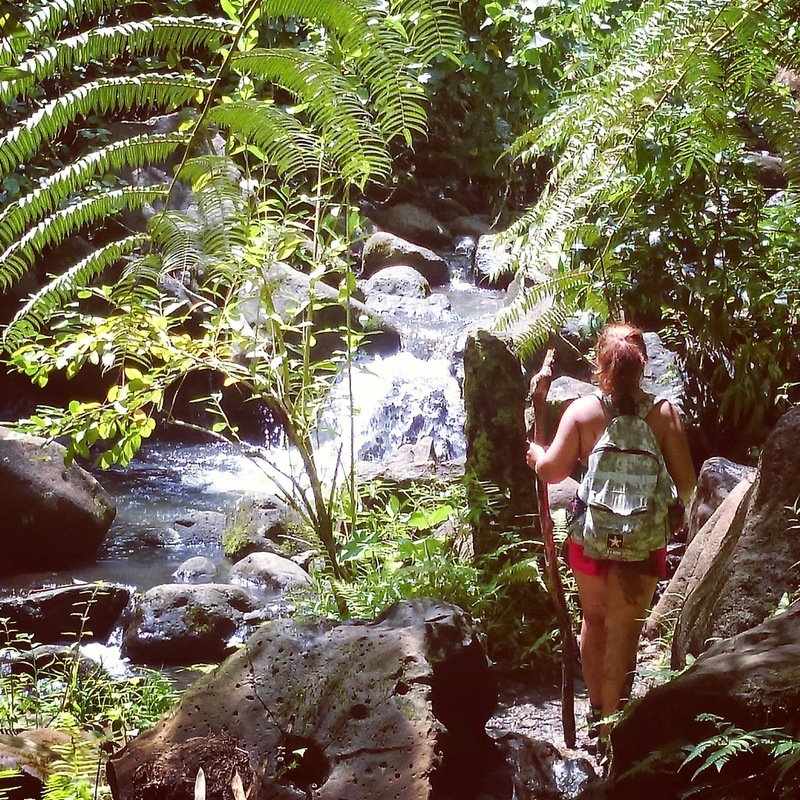 The Maunawili Falls trail is short, muddy and wet. There is literally mud the entire way through. I can’t imagine there ever being a “dry time” to go on this hike. Conditions: Muddy and streams. Uneven ground with star, inclines and declines. Wet gulches with tree cover on 90% of the trail. Difficulty level: Without the mud this would be an easy 45 minute trek to the falls at the end. The mud makes this trip a little bit towards the moderate end of difficulty. Notes: Keep dogs on leash. No biking or mountain climbing. The small waterfall and the watering hole at the end of the hike is the best part about this hike. There is another spot where you can stop to cross the stream which is kind of cool, too. There are some short areas and inclines with some steps which are safe and very well maintained by someone. (Probably volunteers). The last 100 yards of the hike was my favorite as you are hiking through the stream and over some rock to get to the watering hole. Once you’re there you can swim out the small, rock wall and jump the 8 feet into the water. For those of you who are real daredevils you can climb higher and jump 30 feet into the watering hole. The trail is mostly covered so a one-time application of sunscreen before heading out should suffice. Unless you sweat a lot. Re-apply at the watering hole whether you swim or not. Lots of mosquitoes. Lather on the bug spray. REALLY MUDDY. Wear appropriate foot wear. Sandals are not APPROPRIATE! You will slip and hurt yourself. IMPORTANT NOTE: Residents are complaining and they are petitioning authorities to closing the hike. People are leaving trash and piles of muddy shoes from beginning to the end of the hike. NOT COOL. If you take it in then you take it out. Be cool. Malama Hawaii. Don’t be a jerk and ruin it for everyone else! Please be quiet in the neighborhood and park far away from the trail head on the street somewhere. Directions: Drive along the Pali Highway towards Kailua, through the tunnels and past Kamehameha Highway. Pass Auloa Road (on the right) for the first time, then take the second turn onto Auloa Road (it is a horseshoe shaped road). The road splits very soon after the turn off the Pali - take the left fork which is Maunawili Road. Follow Maunawili Road until it ends in a residential neighborhood. Notice the trail access road to your left (look for trail signs). DO NOT DRIVE OR PARK ON THIS PRIVATE ROAD! Instead, legally park on the right in the neighborhood. Please respect the residents by not loitering or making a lot of noise and obeying parking laws. Walk along the access road until you reach the trailhead on your right.